Don't squander your most valuable resource! Collectively, your workers are your company's most important and most valuable asset. To make the most of this asset, nothing beats quantitative performance and investment measurement. Learning and Development is an 80 billion-dollar industry, and every valuable employee represents a sizable investment on the part of your company. To keep your business moving forward, effective management of human capital is crucial. It generates plenty of data, and deep analysis of this data helps you provide feedback and make adjustments to capitalize on the combined knowledge, skills, and creativity of your workers. 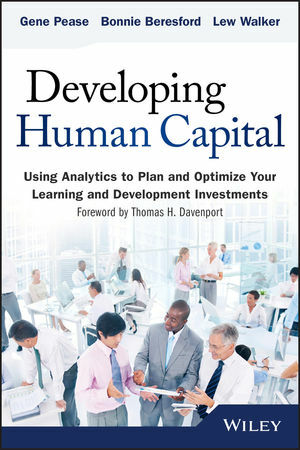 Developing Human Capital: Using Analytics to Plan and Optimize Your Learning and Development Investments provides a guidebook for collecting, organizing, and analyzing the data surrounding human capital so you can make the most of your employees' potential. Authors Gene Pease, Bonnie Beresford, and Lew Walker provide case studies in which major companies applied human capital analytics to guide people decisions, and expand upon the role of analytics in Learning and Development. Developing Human Capital: Using Analytics to Plan and Optimize Your Learning and Development Investments is an essential guide to 21st century human resources and management practices, and can keep you from squandering your company's most valuable resource. GENE PEASE is the founder and CEO of Vestrics (a Capital Analytics Company), the leading provider of workforce optimization software and consulting services. The firm has been recognized with awards from Bersin and Associates, CLO Magazine, CIO Review Magazine, Gartner, and the ROI Institute. BONNIE BERESFORD, PHD, is the Director of Performance Strategy and Design at AMCI Global. While Vice President at Capital Analytics, Beresford’s work has earned her clients three CLO Magazine - Business Impact awards. LEW WALKER, SPHR, is the Vice President of Human Resources at AT&T. He serves on the Editorial Board of CLO Magazine and is a frequent conference speaker.